This is a type of autoimmune disorder, meaning that the body's immune system attacks and destroys its own healthy body tissue. It involves tightening and hardening of the skin and the connective tissues i.e., the fibers that provide the framework and support to the body. For some, it only affects the skin but it also harms the blood vessels, internal organs and the digestive tract. This occurs more in women than in men. 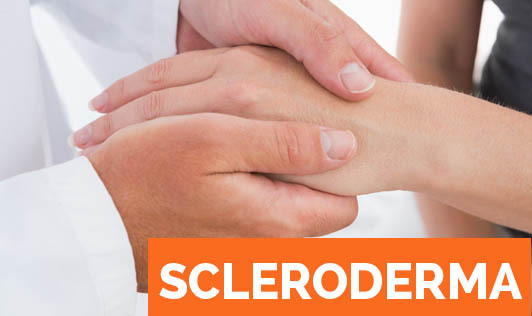 There are several types of Scleroderma, but the two main types are: Localized that affects the skin on the face, hands and feet, and Systemic which affects the blood vessels and major internal organs. This results from an overproduction and accumulation of collagen in one's body tissues. It is unknown as to why the immune system attacks the body, producing inflammation and overproduction of collagen. • Hardening and tightening of the skin. • Patches on the skin but they vary by the type of scleroderma. • Patches are oval and round shaped, and vary in size. • Movement of the affected area may be restricted. • Acid reflux or heartburn which can damage the section of the oesophagus nearest to the stomach. • Problem absorbing nutrients if the intestinal muscles aren't moving the food properly. • Scleroderma can affect the function of the heart, lungs and kidneys and the problems can become life-threatening. • Numbness, pain or colour changes in toes and fingers. • Fingers or toes that turn blue or white in response to cold and hot temperatures (Raynaud's phenomenon). This also occurs in people who don't have Scleroderma. There is no specific treatment for Scleroderma. Doctors aim to control individual symptoms and prevent further complications with a combination of medications and self care.